Hair multiplication or as is called “hair cloning” is creating many hairs from a single hair follicle for hair restoration. Some hair transplant surgeons have either researched or are involved in the study and development of hair cloning and hair multiplication. 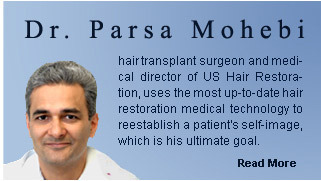 We at Parsa Mohebi Hair Restoration are involved in some studies and we will release our results as soon as they are available. However, hair multiplication (cloning) is still in its infant stage and we have a long way to go in order to have something that can be practically used for hair restoration in humans and so far their research has been promising. In recent articles in medical journals, scientists discuss what is being done so far for hair multiplication in more details. The procedure is also called Follicular Cell Implantation (FCI) as a means of cell therapy for restoring hair. The process of culturing hair cells is based on the demonstration that adult dermal papilla cells (DPC) retain the hair inductive potential that they acquired during hair morphogenesis before birth. By isolating hair inductive cells from the scalp through biopsies, they then propagate them in culture media in order to provide adequate cells to generate several new follicles from a few. Hair transplant surgeons are hoping that this process and others in reference to hair cloning can someday be refined and able to create natural looking hair. Hair cloning or multiplication can be the new standard for hair restoration in the future. Most people may not even need hair multiplication and the current technology can be used to completely restore their hair. However, hair cloning may be needed for severe hair loss conditions when patients don’t have adequate donor hair. Parsa Mohebi Hair Restoration will be following up on this study and will continue to update our patients with new findings when they arise.